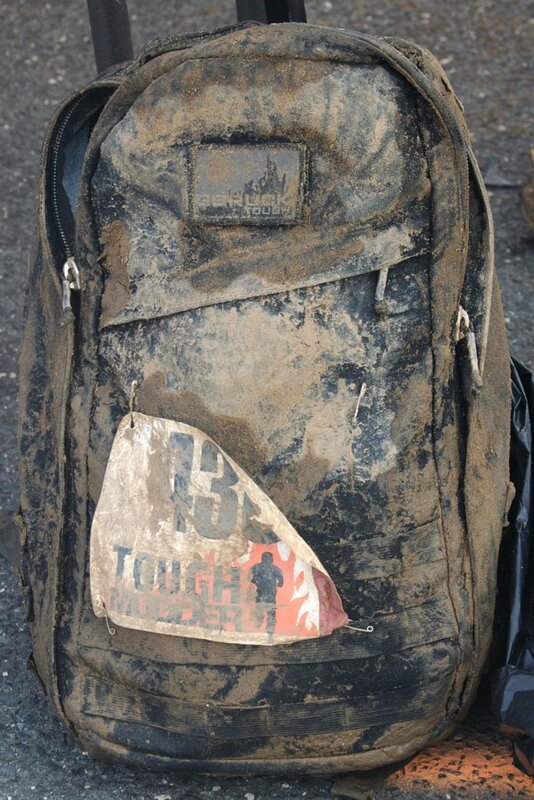 Five years ago we were selling GR1s from the trunk of a rental car at GORUCK Challenges and while the experience of carrying GR1 with weight for 12+ hours is enough to convince most people they need one, the gearheads of the world wanted more. More details and more story. This post, originally published January of 2011, was our response of more. So grab a beer or something before you dive in, this is a long one. 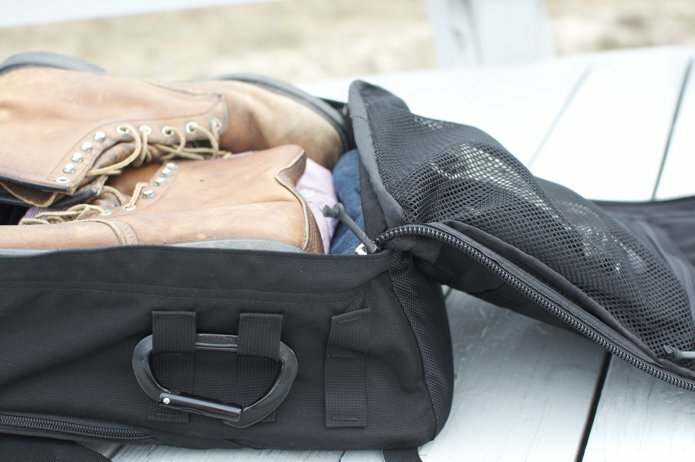 A simple black bag, comfortable in any and every environment imaginable. 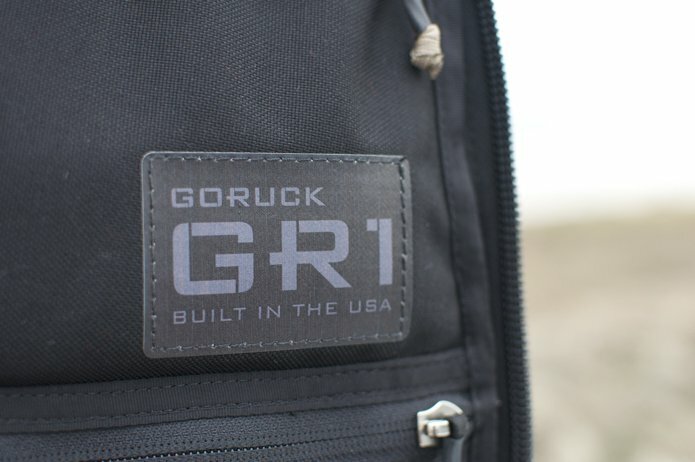 And while I started GORUCK to be so much more than a gear company, we’re proud to build the best, and to do it right here in the USA with American workers and American materials. GR1 took us a year and a half of prototyping and field-testing to get right, and we started selling it when it was ready and not a day sooner. My background is not in sewing or even in product design; my background is as a Green Beret well versed in how gear holds up, and more importantly, how and why it fails in the harshest of conditions. 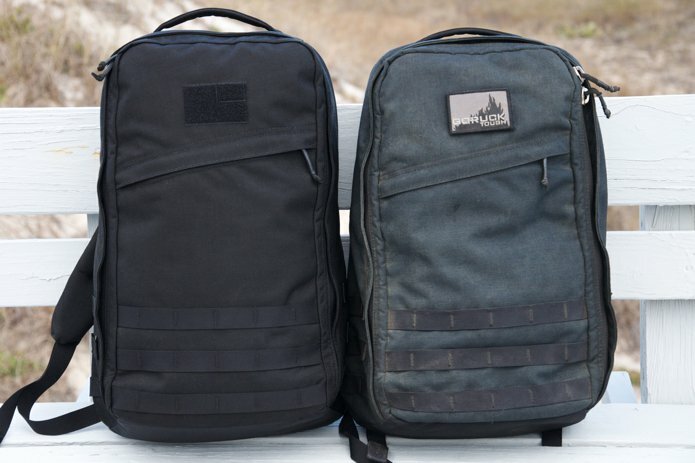 A few of us started work on GR1 in 2008 (yes, including sewers and product designers), and our focus was to take the best features of the different military rucks I had in Special Forces (SF), but to simplify everything to the essentials and let people customize it from there. Because buddies of mine now use our rucks in war, I’m constantly reminded in the most personal of ways that the gear will be used, and abused, and that it better hold up. So as I hope to show below, no detail is too small to consider, and the end result is a highly functional yet simple bag that only gets better with time. These illustrator drawings laid out every proportion of the bag down to the millimeter. Once complete, we began prototyping and field-testing the bags, which led to small yet important changes. All pics in this post show GR1 as it now is (and not as it was); a slight disclaimer is that we are always looking for even better construction techniques to improve upon each and every detail of the bag, so the newest GR1’s may adopt slight changes. But rest assured, the greatest improvement is time and wear. 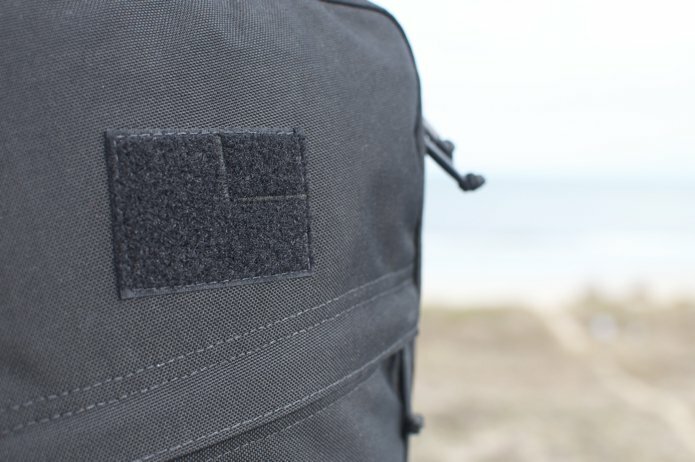 The GORUCK logo is not found anywhere externally on GR1. There is only a 2"x3" piece of Velcro on the front which can hold any standard patch of your choosing. I always had a reverse flag on my rucks when I was in Special Forces. 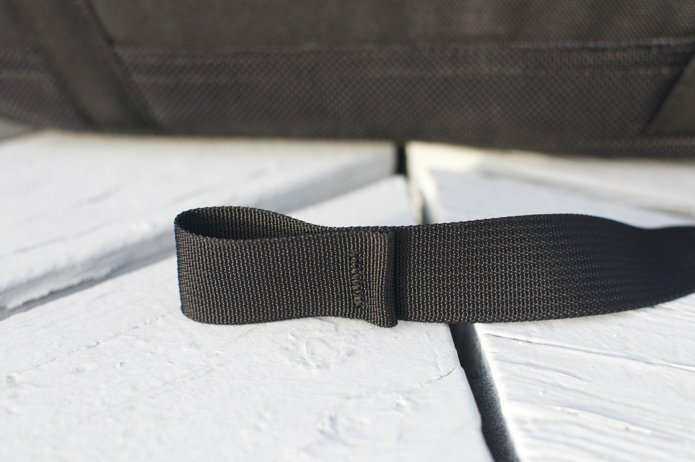 GORUCK’s 2x3 Velcro strip has a small detail stitch in it that, like the GORUCK flag patches, takes inspiration from the reverse US flag worn into combat to this day. The reverse flag dates back to the Army’s early history when both cavalry and infantry units would charge forward toward the enemy. The standard bearer carried the Colors into battle and the star field always faced forward as the flag moved with the charging unit. The reverse flag is a symbol of honor, courage and respect. 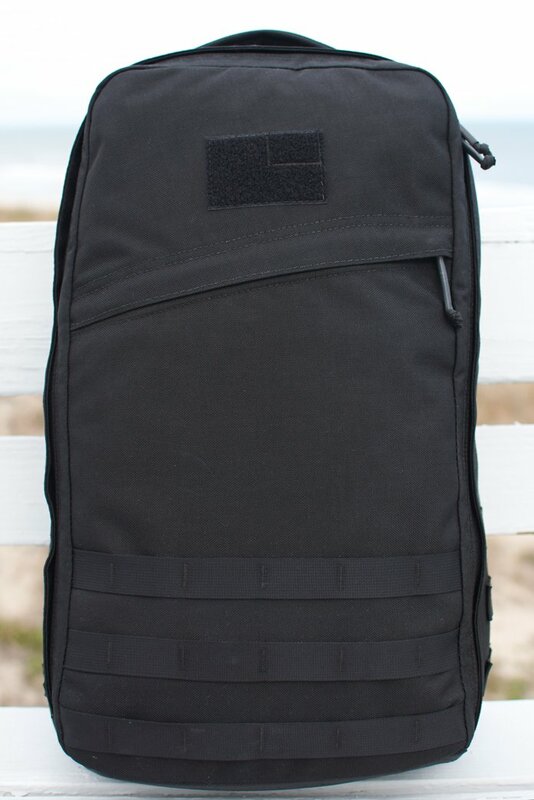 My patch of choice now is the GORUCK Tough patch (pictured later). Three rows of webbing at the bottom of GR1 follow the MOLLE system used by the military, which allows soldiers to customize their kit with accessory pockets of their choosing (think: ammo pouches, magazine holders, grab bags etc.). Many packs I was given had pre-built in pockets externally. 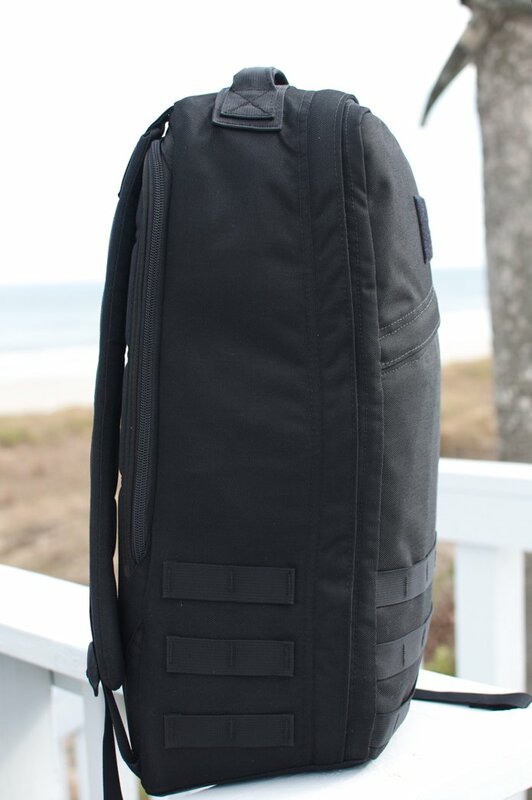 Many civilian packs have water bottle pouches on the side. However, we preferred to let soldiers and civilians add pockets (or not) as they see fit. 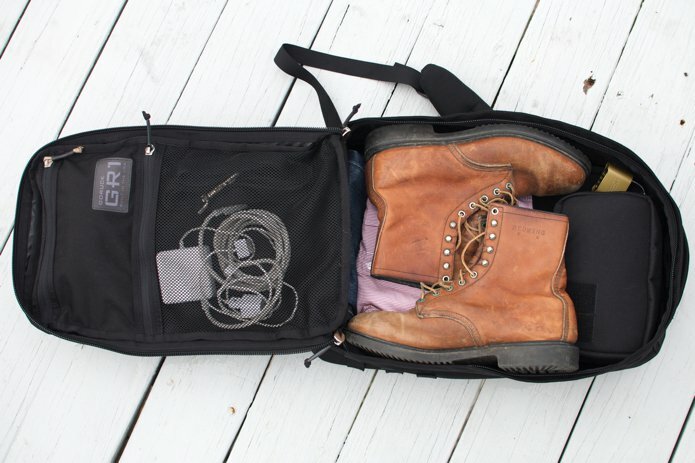 Built in pockets would permanently expand the ruck, and we preferred to keep it simple and minimalist. 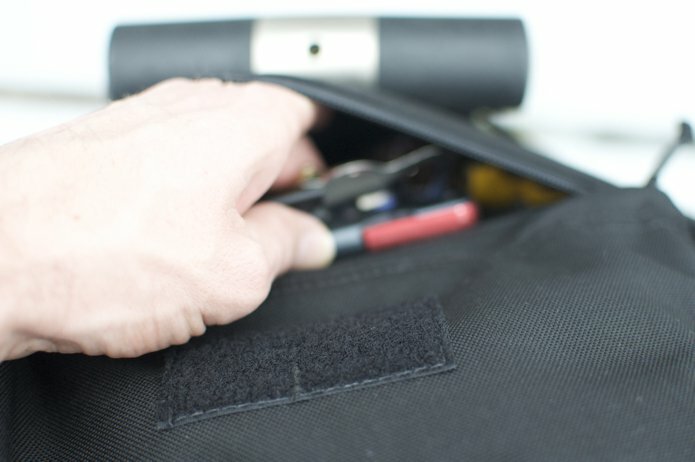 We are currently working on a line of accessory pockets that, like GR1, will be sold when they’re ready. And it’s your choice to use them, or not. 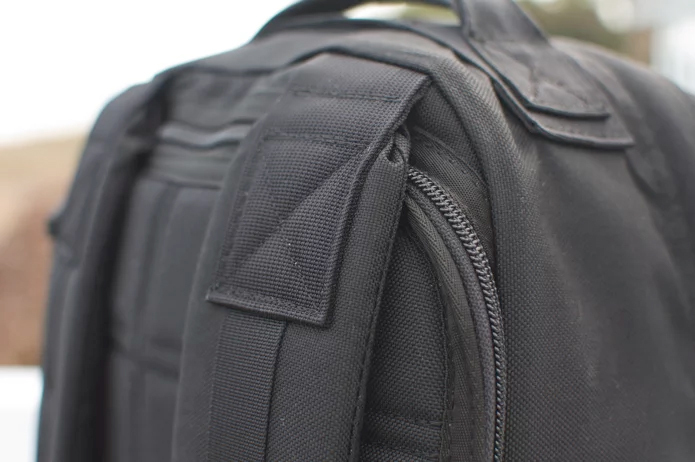 While all the materials we use are military-grade, the primary one is Black 1000 Denier Cordura, a DuPont developed product that has proven its performance in some of the most austere conditions possible. It comes in a ton of different colors (and we’ll offer more in the future), but for us black was the only first choice. We’ve even grown fond of Henry Ford’s quote: "I’ll give you any color you want so long as it’s black." The ‘Denier’ refers to the linear mass density of the fibers, and there are all different weights out there. 1000D means that it is has the mass in grams of 1,000 per 9,000 meters; as a frame of reference, a single strand of silk has a Denier of 1. We use the 1000 Denier version because it’s been proven (to me and others) to hold up best in war, offering exceptional abrasion resistance and strength-to-weight ratio. We are often asked if the bags are waterproof, which is a question that goes to the properties of the fabric itself. The short answer is no, the long answer is that waterproof to our standards means you can leave it at the bottom of the ocean for a week and nothing inside gets wet. 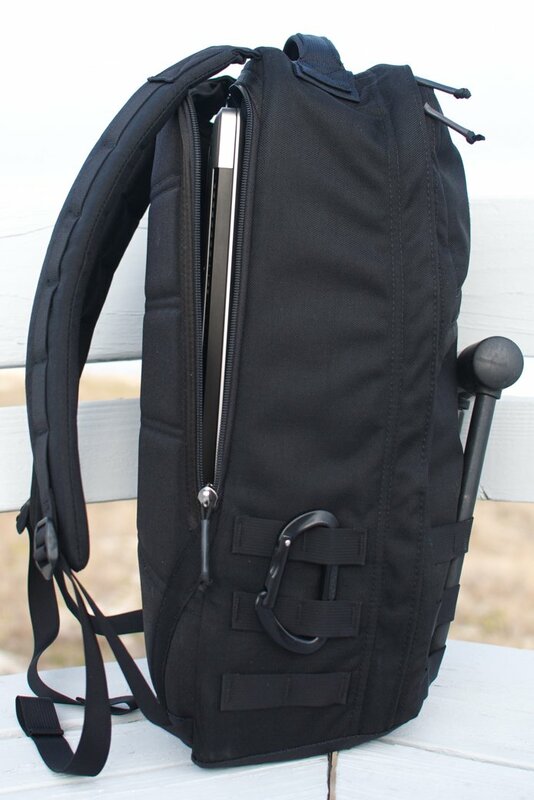 1000D Cordura is highly water-resistant, by military standards, and I never worry about carrying my electronics around town even in a downpour. 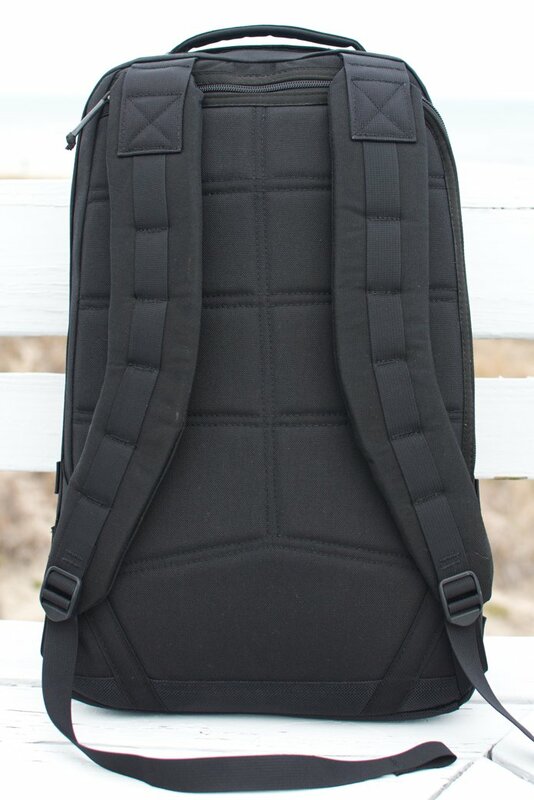 The shoulder straps have a single strand of webbing down the middle of them which serves two purposes: (1) it allows for customization with a chest strap or accessory pockets (yes we have them in development, and yes they’ll be available when they’re ready) and (2) it allows the straps to better bend to the wearer’s shoulders and back, working in tandem with the back panel’s contours. 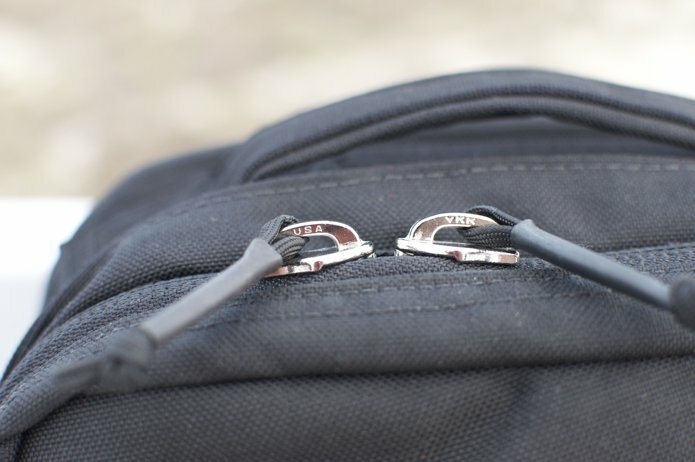 Zippers are the weakest link in any backpack. They do not play well with threads and typically begin to fail when subjected to harsh conditions such as sand, dirt, and mud. If a company develops its own zippers, in my eyes it’s always an indicator that they’re comfortable saving a dime or two as they make an inferior product. YKK zippers are the only zippers I trust because I’ve subjected them to everything, and seen them perform during Middle Eastern sandstorms and after being dragged through the mud. 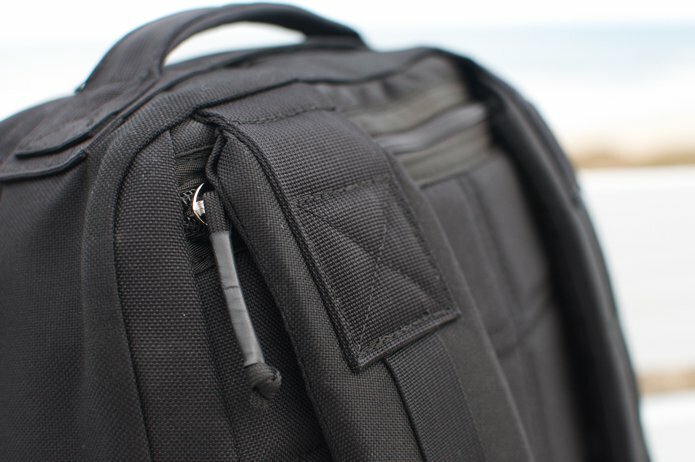 GORUCK uses YKK zippers, the made in the USA versions of course, and we will not be developing any of our own, ever. The stitching that holds the webbing down along the straps creates small contours and these contours allow the straps to develop habits based on the wearer’s individual frame. Each section of the back panel and its padding is separated by seams that allow circulation to the wearer’s back when worn. 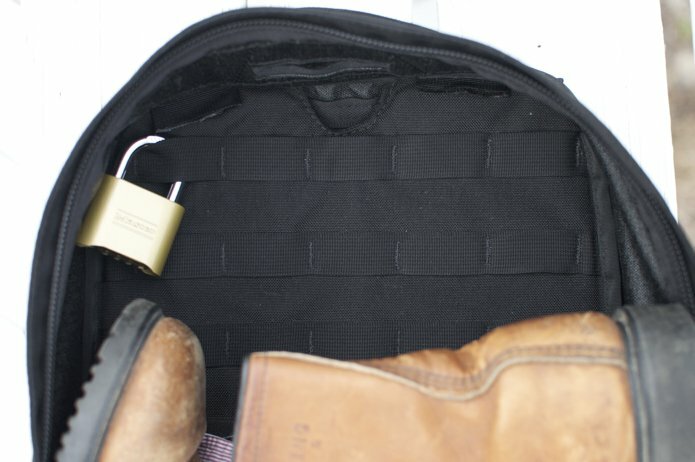 And while GR1 comes stiff (as is the case with 1000D Cordura), there are construction techniques we’ve employed that allow it to break in and become yours over time. The placement of this zipper, and figuring out how to make it flow smoothly along the chain as it rounds the corner, was the obstacle that required more time than any other challenge we faced. It’s also vital to the functionality, so we took the time to make sure that it slides smoothly and functions properly, allowing for ease of entry into this compartment. If you see me biking around town, this is more or less what my GR1 will have in, and on it. I take my laptop everywhere, all the time, no matter the weather. 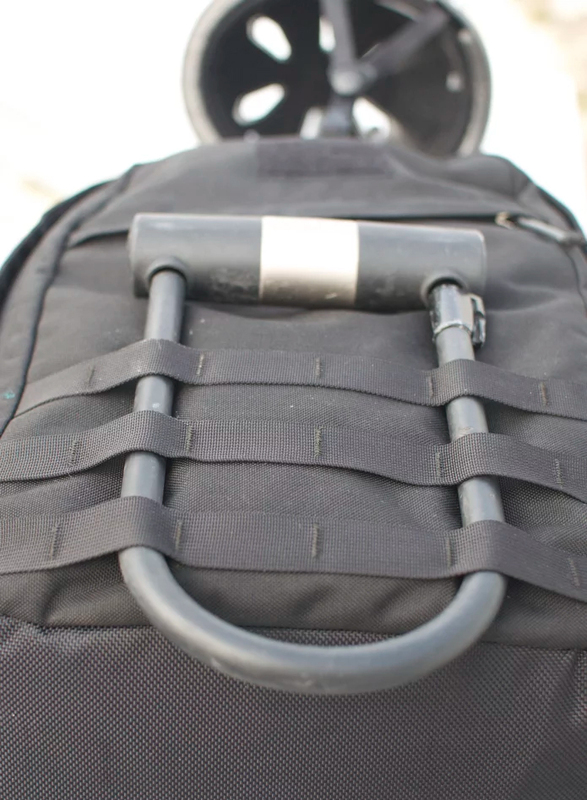 And when I bike I like to use the front webbing for my bike lock and the side webbing for a D-ring (carabiner). 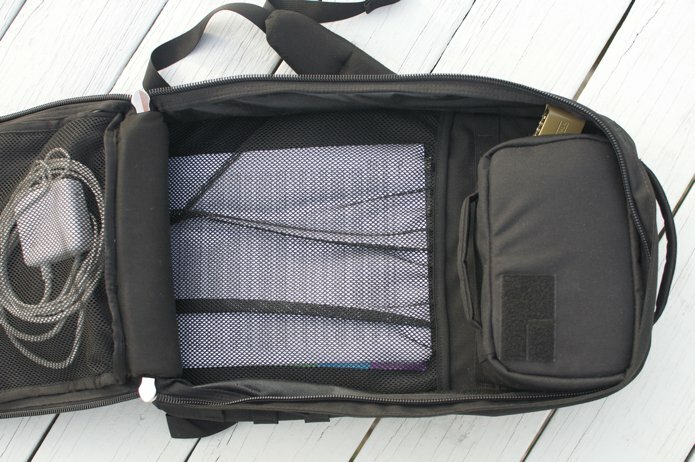 The laptop compartment is completely separate from the main compartment, though there is a hard, plastic frame sheet in a separate Velcroed-down compartment contained within. I removed the thin, white frame sheet from the compartment for the purpose of showing where it is and what it does. This frame sheet supports the integrity of the pack as you weigh it down and ultimately allows you to carry a heavier load more comfortably. I removed the laptop to give a better sense of where the frame sheet is. In this picture, the frame sheet is still slightly removed from its compartment. The fabric tucked behind it in this picture bends over the top and Velcroes down, concealing the presence of the frame sheet compartment entirely. The carrying handle is double layered with padding sewn in between 1000D Cordura to make it more comfortable to pick the bag up this way. On a different note, if you notice the yellow chalk dot in the middle of the area beneath the carrying handle, this is where the middle has been measured and marked, by hand. There is no machine that spits GR1’s out. It is labor intensive from start to finish and American workers are integral to its success. And if you happen to ever find a spot of yellow chalk on one of our products, not to worry, it comes right off with a gentle rub. 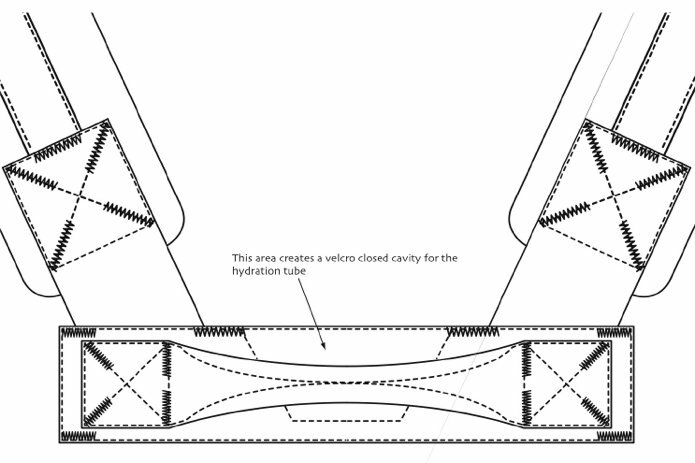 When I go for a ruck or lead a GORUCK Challenge, I use a hydration bladder in the main compartment. Shown with the hose exiting from the top. Something so simple as the bottom of the webbing straps used to cinch down the shoulder straps. Creating a loop gives you something to grab onto and makes it easier, especially if you’re wearing gloves or for some reason your fingers are extremely cold and lack dexterity. Placed on the top internal pocket, this is the only logo or product description you’ll find on or in the bag. I’m not a lover of wearing logos for the world to see. In fact, I’ve been known to cut them out entirely or to simply ignore brands that try to get me to advertise for them. So we kept it subtle, and simple, and internal. 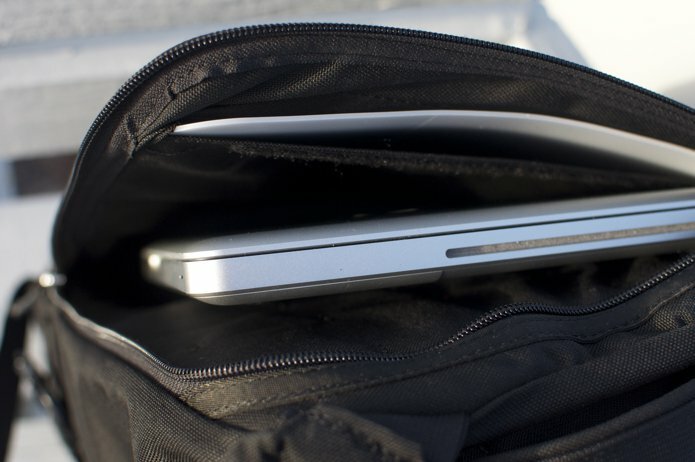 GR1 lays completely flat, a feature that allows for optimal organization and efficient packing. Most packs turn into a gypsy camp at the bottom where you have no firm grasp of what’s going on down there. 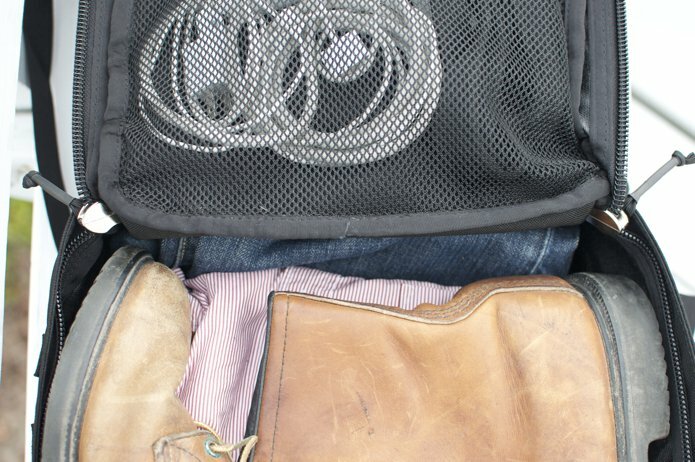 Because GR1 opens flat, gypsy camps don’t survive and organization is easy. 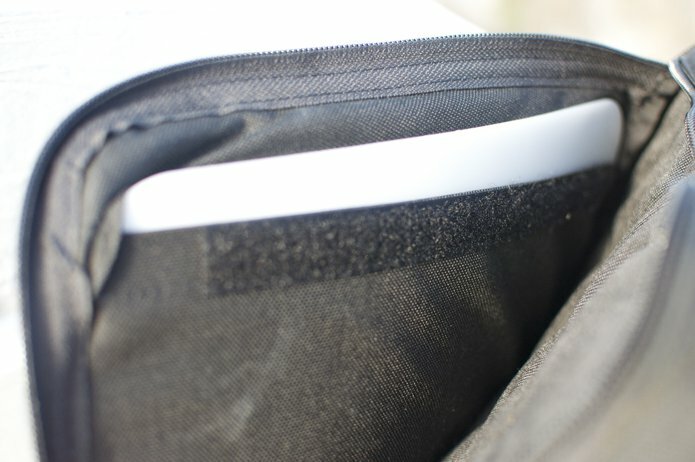 Internal mesh pocket with an elastic band shown. (NOTE: the mesh sleeve shown has been upgraded to a Cordura sleeve with an elastic band closure. We did this to increase the durability, especially because of wear and tear we saw over time via the GORUCK Challenge and the fact that this main compartment houses wrapped bricks). Also shown is a prototype of an accessory pocket I’ve been testing out called a GR1 Field Pocket. 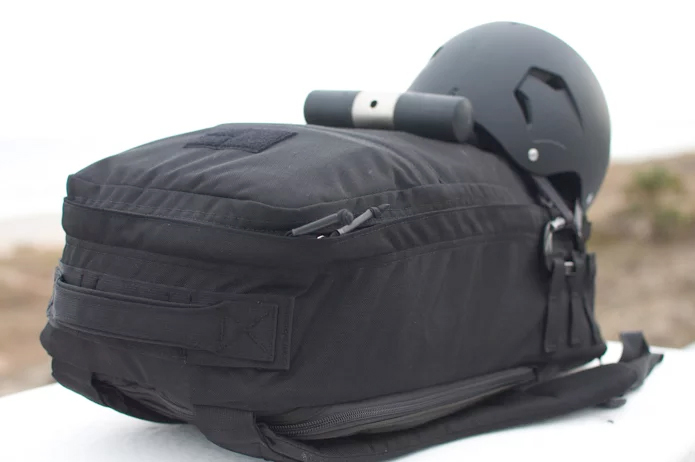 It attaches to the internal webbing (shown up close later) or the external webbing but also works great stand alone as a dopp kit. 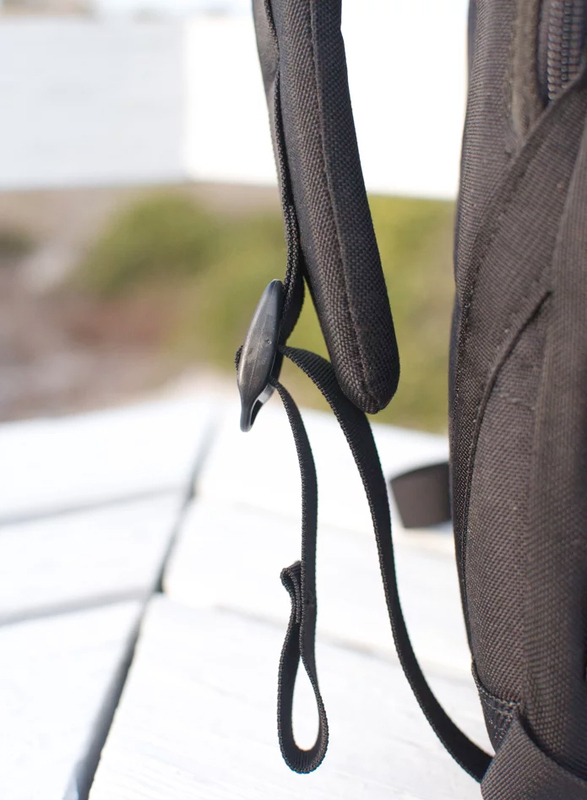 Our zipper pulls are silent, which makes it easier to move through life without the annoying clanging of metal on metal. We take 550 parachute cord and remove the internal strands before pushing it through rubber shrink tube, tying the ends into a knot and burning the edges, which prevents fraying. Attaching this to the zipper head is a relatively straightforward process and one that lends itself to custom zipper pulls with different colored 550 cord. On the GR1, this is the only coyote/khaki colored pull, the rest are black. This top internal pocket with the coyote pull I causally call my go-to pocket. I keep my sunglasses, iPod, note pad and pens in there, they’re easy to get to and isolated from the rest of the internal compartment, which is more suited to larger items. 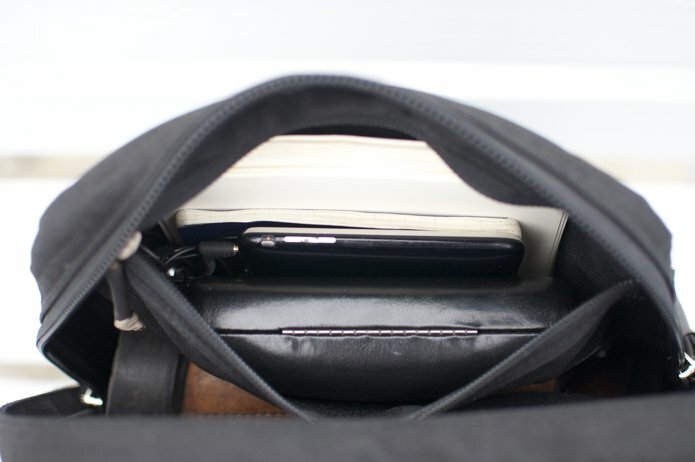 The slant pocket on the exterior of the front of the bag is where I keep my keys and quick snacks. Preferably Peanut M&M’s. 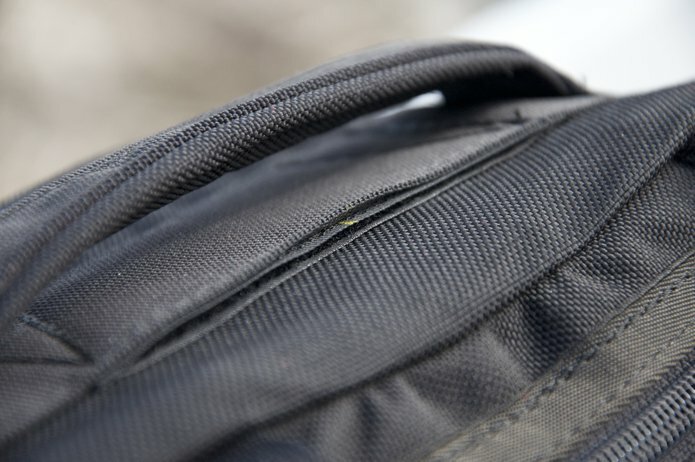 With a full pack, this pocket is compressed against the internal contents and does not provide a ton of volume, but there is just enough space for a few important things that you like to get at in a real hurry. 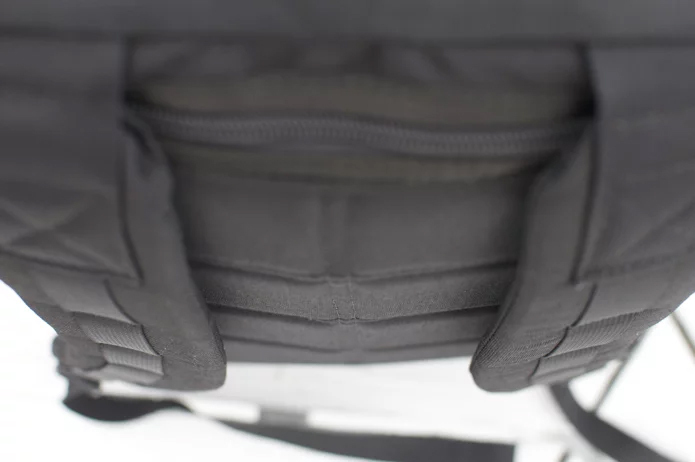 Detail showing how the bag lays flat. Three rows of webbing inside GR1 mirror the three external rows. I always have a Master Lock attached to mine (unless it’s in use, of course). 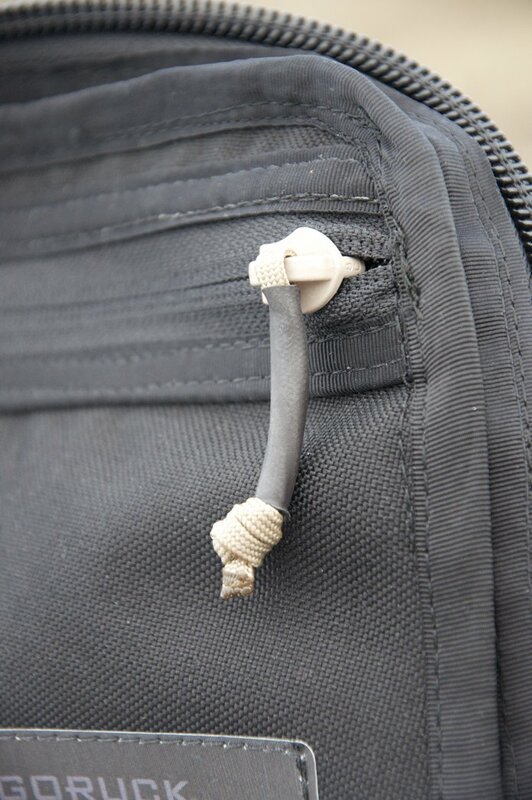 We are prototyping a line of accessory pockets that will attach to the webbing externally or internally. As you may suspect, they’ll be out when they’re good and ready. But they’re close. 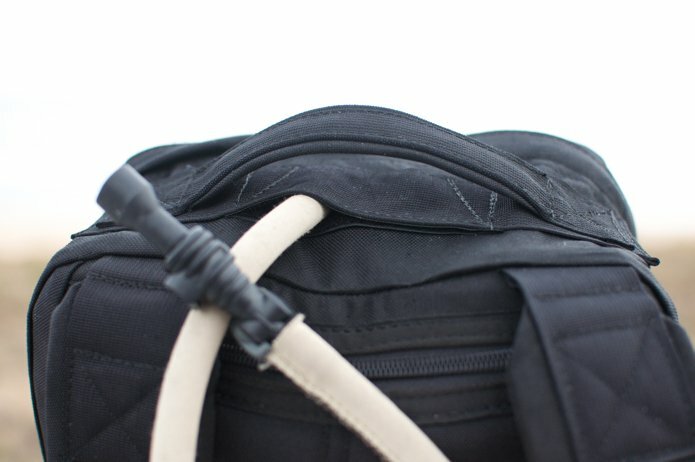 The bottom of the GR1 has Ballistic Cordura, which is slightly heavier than 1000D Cordura used elsewhere. 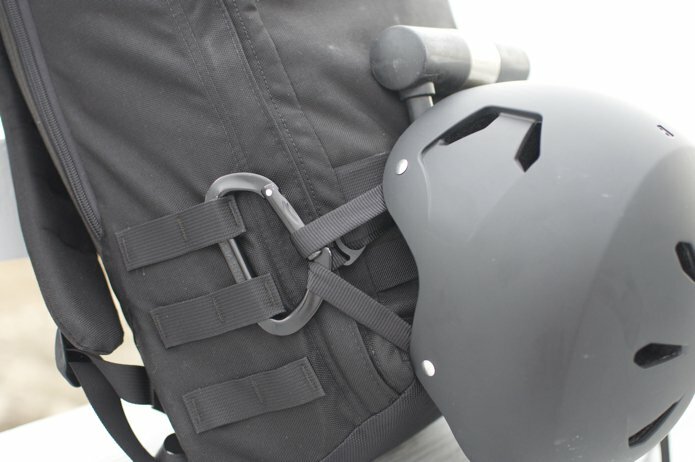 Though not flexible enough to be used on the entire pack, it offers increased abrasion resistance. 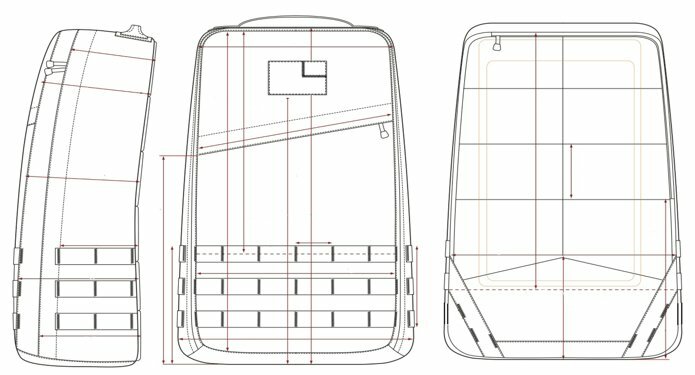 NOTE: over the last years, we have seen limited but still too many problems associated with using 1050D on the bottoms of the rucks. It’s bulkier than 1000D and therefore harder to sew, kind of like trying to eat a sandwich that’s bigger than your mouth. Yeah, you’ll figure it out, but it’s messier than usual. 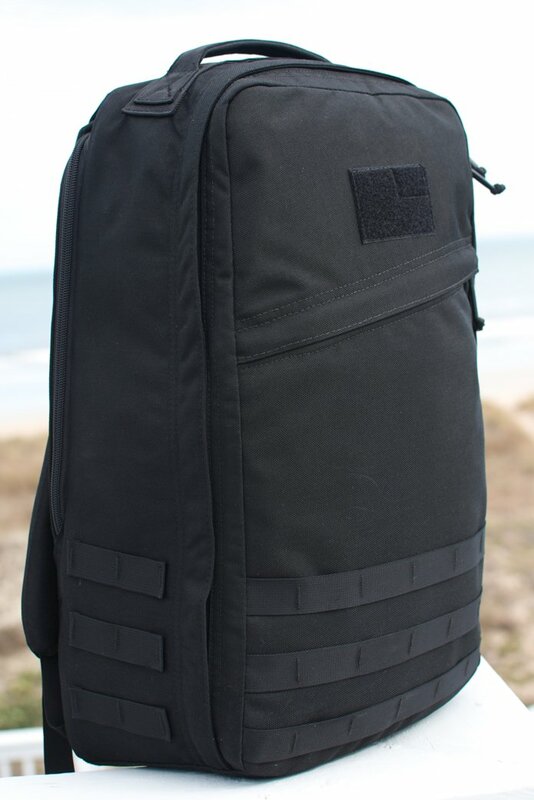 We do not and have not seen any problems from our Scars Department with the 1000D bottoms (which have been on the colored GR1’s since forever), so we made uniform 1000D Cordura bottoms on all black rucks as well in 2016. All still come with our Scars Lifetime Guarantee, and offer all the abrasion resistance you’ll need, and then some. I’m known to bike around from time to time without a helmet on. Especially on nice days. Yes, it’s dangerous, yes it’s more fun that way. Life has risk. I know. But I’ve got a system to house the lock and the helmet while I bike in case I decide on the return trip (which may be after the sun is down) that I want to wear my helmet. The point is not that this is a good system, or even especially smart. The point is that it’s my system, and it works for me. There are a lot of ways to use this bag, to make it yours. I expect you to wear a helmet. And figure out your own system that works for you. I’ve used this exact bag every day for the last year, all the while putting it through the types of hell I find fun. My job is to ensure that we’re doing everything we can to make the best gear possible. 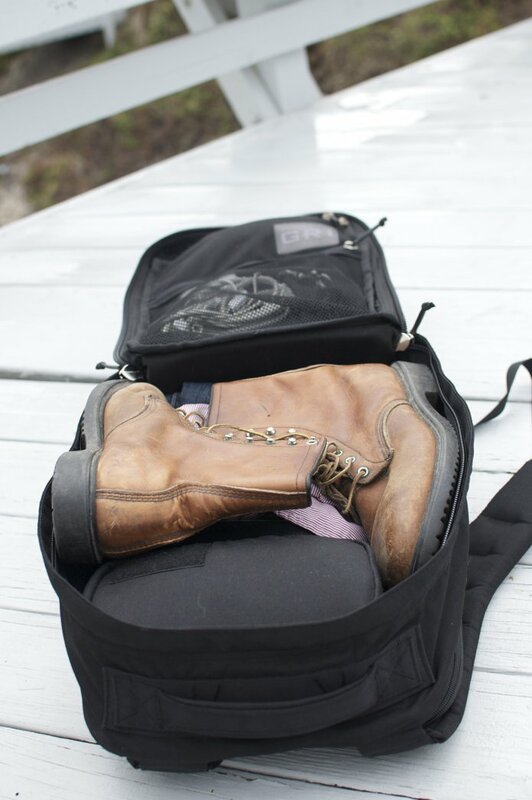 Gear that holds up to anything and that gets better with time and use, like your favorite pair of blue jeans. A brand new GR1 on the left, my distressed GR1 on the right. The same muddy GR1 from the previous picture, in fact. Mine is better now than ever, and I have no plans to trade it in for a newer model. The black Cordura fades a little bit with time and extreme use (I’ve cleaned mud off this one countless times), but for me this only accentuates the character, and the scars I’ve earned. 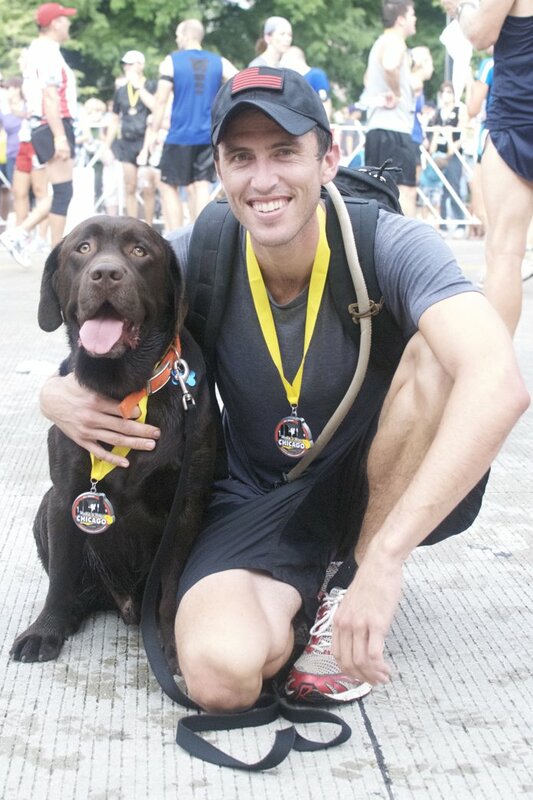 Here’s me with my chocolate lab Java after we finished the Chicago half-marathon together this past summer. I’m pretty sure Java won his division and I didn’t find any flaws in how GR1 distributes its load, a total win-win. My smile doesn’t lie: I love what I do (and I love that I get to do most of it with Java around), and I love where GORUCK is going as a brand. Our commitment is to build the best, and to do it in the USA, and to proudly claim that American manufacturing is the best in the world. And we’re out to prove it with smiles on our faces, one day, one race, one event, one new product at a time. Note: all pics are from 2011. Slight modifications on current models possible. Consult the product page for definitive information.